We’ve started planning our vacation for 2019. At the end of March, we’ll be flying to Tokyo. After a few days there, we’ll rent a car and drive to the coast near Enoshima. 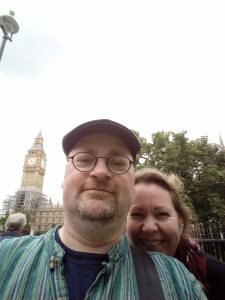 The past two weeks, we went on a vacation to London. 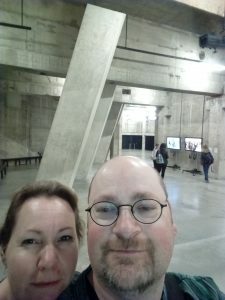 Here’s some crappy selfies I took, and my thoughts about the places and venues where these crappy selfies were taken. 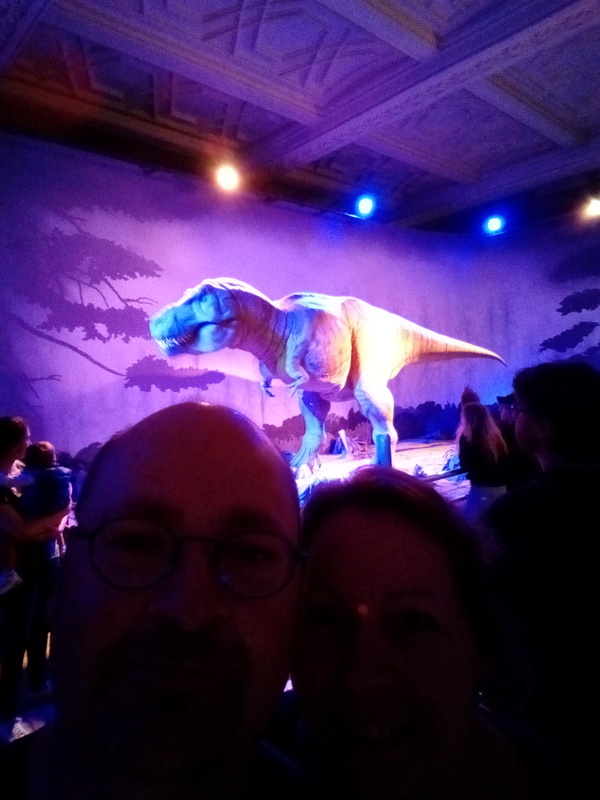 Of course, there is the large array of stuffed and prepared animals, and there is a very large dinosaur exhibit. That’s all very interesting to see, but we spent most time in the geological side of things. Exhibits about volcanoes and earthquakes (including an earthquake simulator that emulated the large Kobe earthquake of 1995) and many beautiful minerals and gemstones. At the end of the day, we also saw the Albert Memorial, just across from the Royal Albert Hall. Dedicated to human creativity in all its aspects, it has a large collection of crafts & arts artefacts from all over the world and from all time periods. 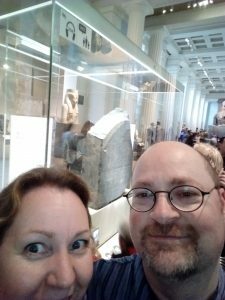 We had visited this before, but this time we went to see different things. There was also a very interesting exhibition about plywood and it’s applications in building and furniture, which was free to access. Unfortunately, it was so busy that we could not find a place to sit to eat lunch at the V&A, so we went out for lunch and came back afterwards. 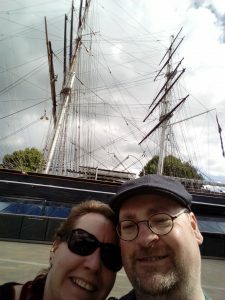 We went to Greenwich on Sunday. It was a beautiful day, and at the square where Cutty Sark is displayed, there were lots of people enjoying the weather. 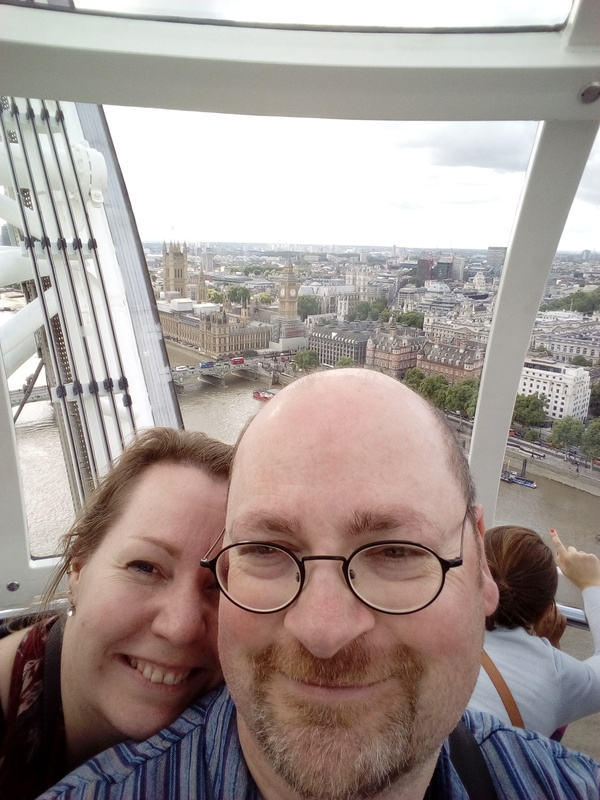 We also visited Greenwich Market, and had a ‘ramen burger’ (a hamburger with patties of fried noodles instead of buns) at the food stalls there before going on to the Fan Museum. 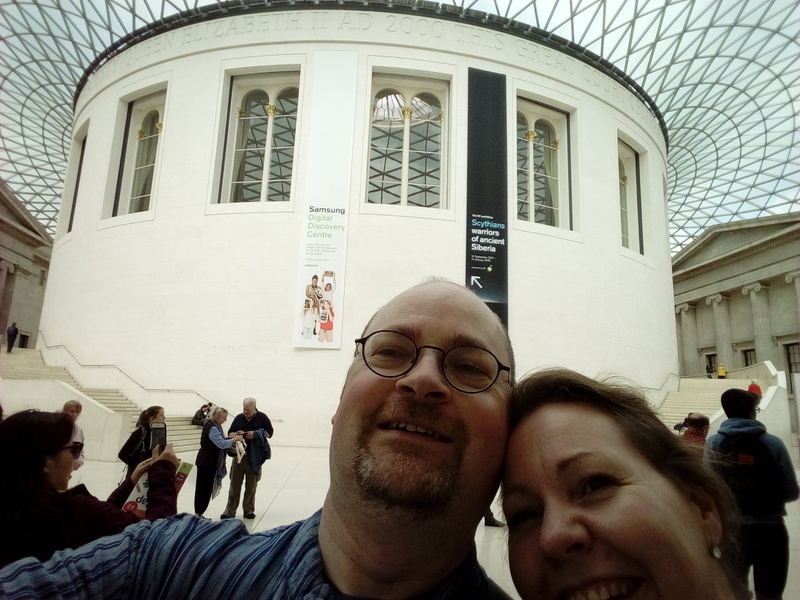 That was a tip from our friend Gert, and it was a delightful little museum. The orangery was open too, but we were still too full of the burger to go for the full afternoon tea, so we just had a cup of tea/coffee. 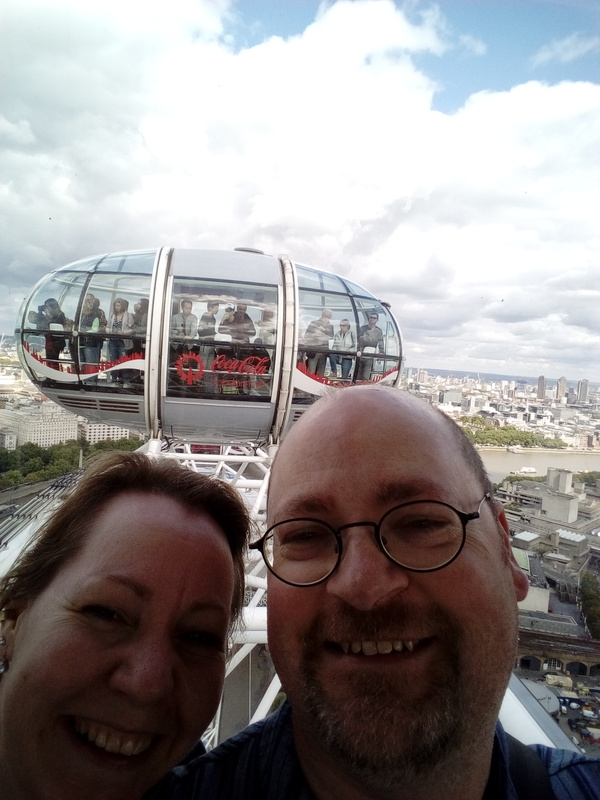 Then we took the DLR back to Tower Hill again, and walker around the Tower. 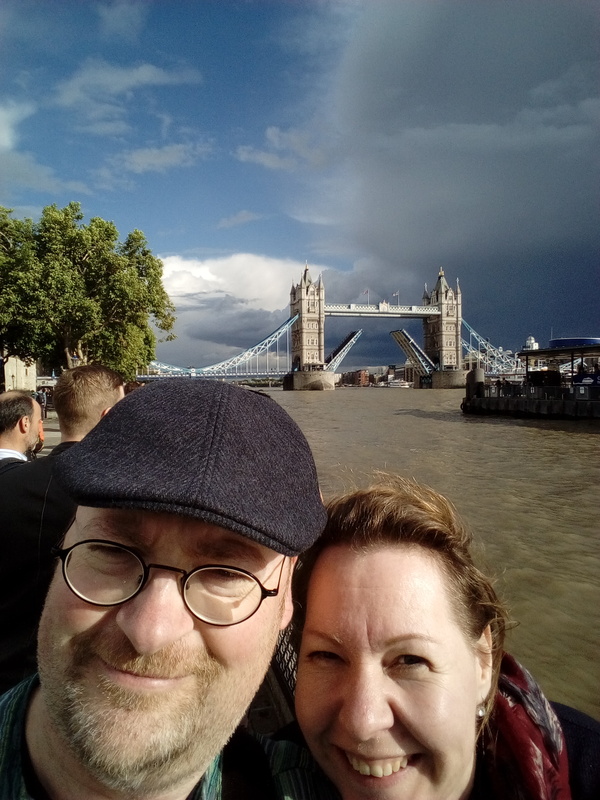 We also saw the Tower Bridge go open to let a sailing ship pass. 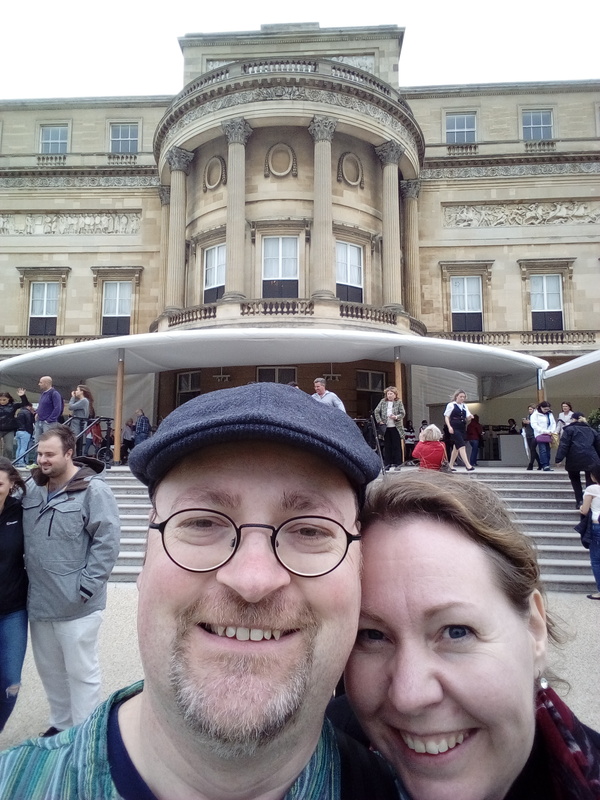 Every year, over the summer, the State Rooms in Buckingham Palace are open to the public. 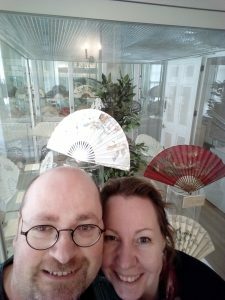 We bought tickets for the 13:00 entrance (entering is timed, but you can make your way through the State Rooms at your own pace). 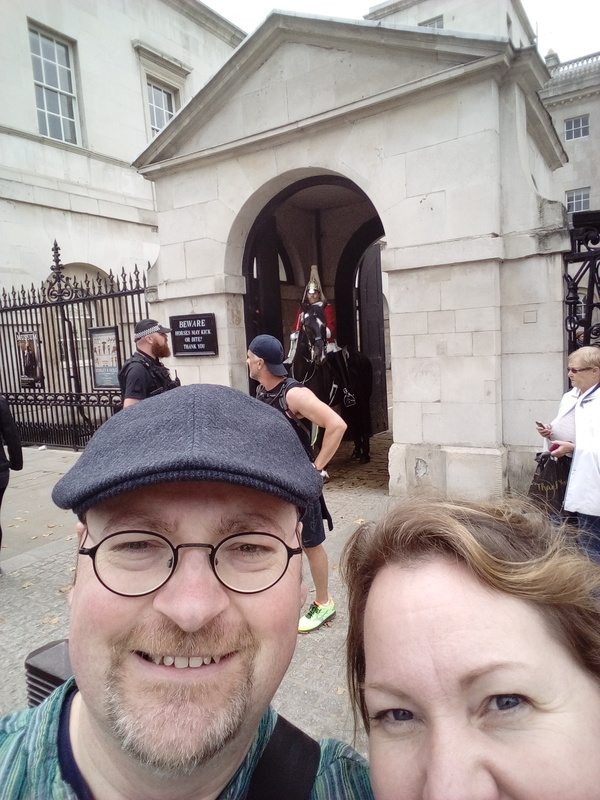 We went to Westminster to see the tower housing Big Ben and the Westminster Palace (through the fences), walked by Westminster Abbey (closed because of worship) and watched one of the horses of the Horse Guards make a nuisance of itself. 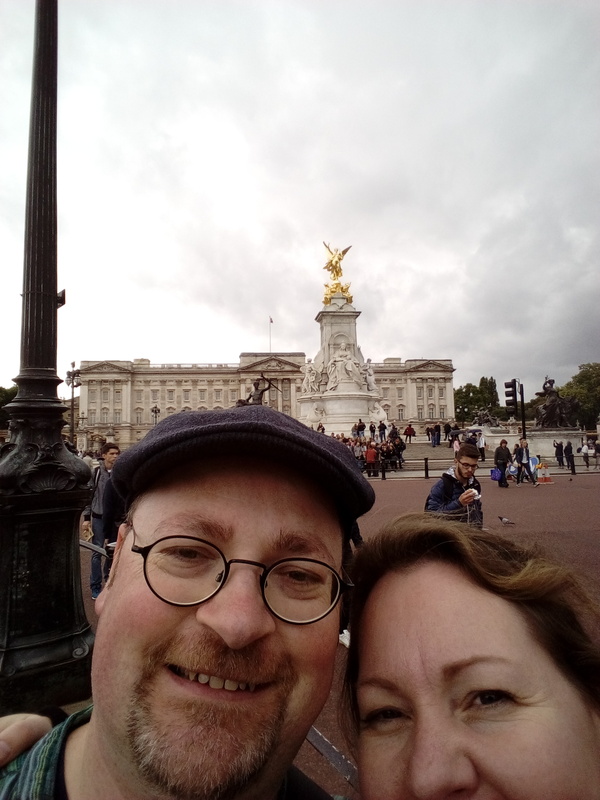 We made our way along the Mall to the Victoria Monument in front of the palace, and then made our way in. It’s very interesting to see these rooms, and there are some architectural tricks that I quite liked. It’s not at the level of opulence that some of the palaces in Bavaria have, but what makes it special is that these rooms are, in fact, still in use for their intended purpose. We ended with a cup of tea and a cake in the Garden Cafe. From paper plates, because the queen doesn’t like washing up. We visited the British Museum, with its very interesting exhibits. 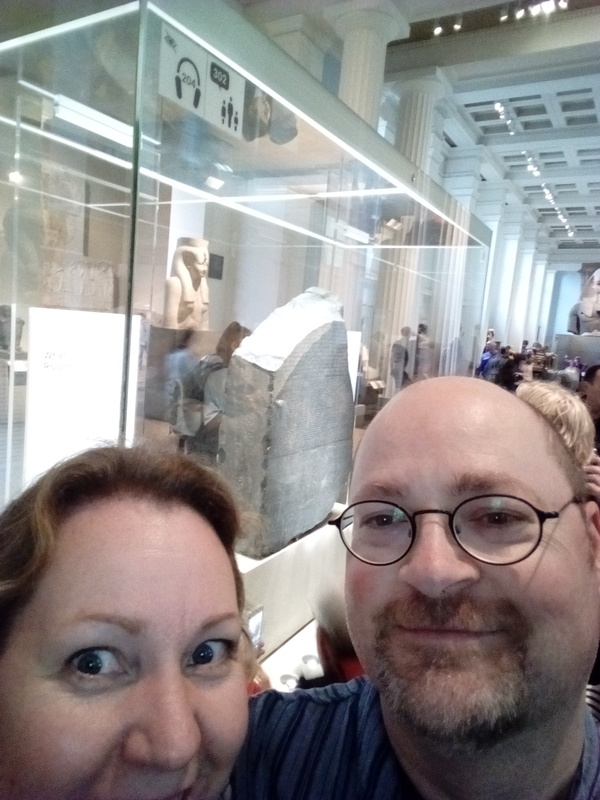 We checked out the Japan section (for obvious reasons), but also went to see some of the Egyptian and early medieval sections, as well as the clock sections and some other things we saw along the way. In the end, we were sent away because it was closing time…! 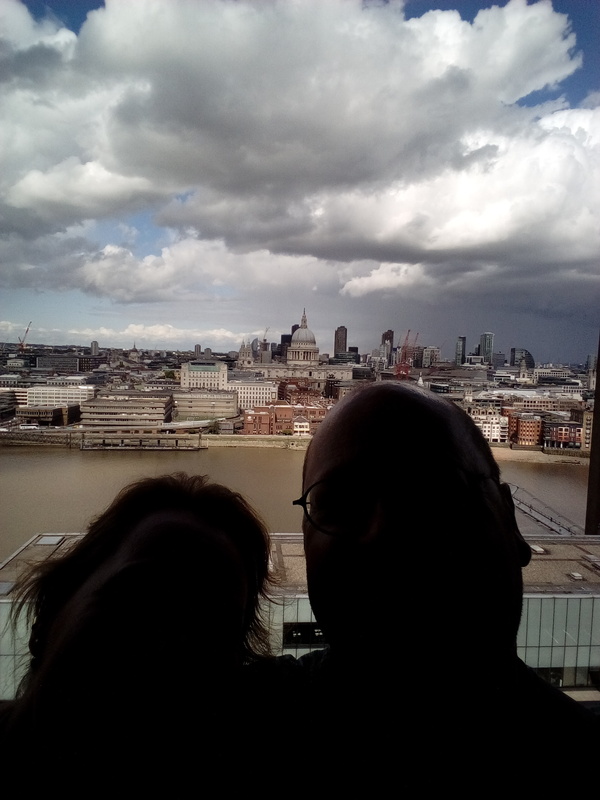 If you’re on a budget, then the 10th floor of the Tate Modern is just as good (better view of St. Paul’s even) and free! 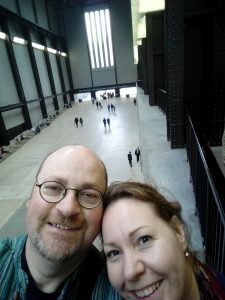 The Tate Modern has a lot of modern art, and some of the collections are free to view. The building itself is pretty cool as well: it’s an old power station, so there’s fuel tanks and all sorts of oddly shaped large open spaces. The tenth floor has an all-around viewing platform. The restaurant on the ninth floor is a rather fancy sit-down affair, which we only found out after we were seated. The food was nice though, but if you’re only in for a sandwich, you’re better off at the ground floor restaurant. 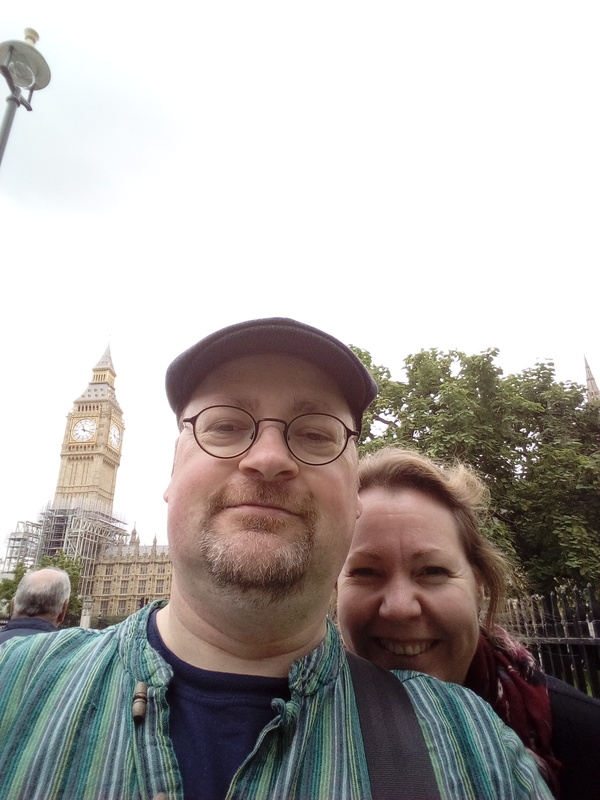 we’ve had a lovely time, but we were happy to be back home (and get the kitties back home too)! 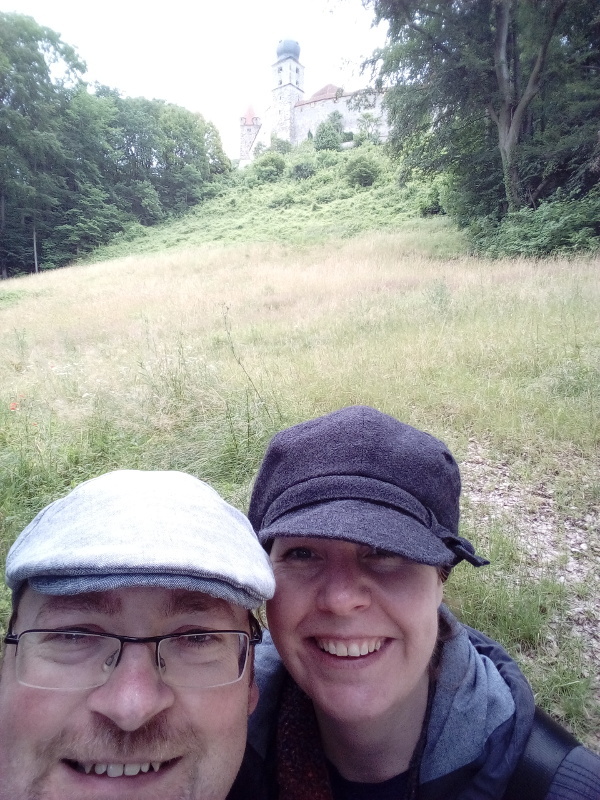 Yesterday, we returned from our almost-three-week vacation to Bavaria to go see the many castles and forts in Bavaria, now a part of Germany. It used to be a part of the Holy Roman Empire and then was converted into a kingdom by Napoleon. At the end of WW1, it became a republic. But what is amazing is that essentially the same family, the Wittelsbachs, has ruled Bavaria from 1204 onwards — first as Duke, then as Electors, then as Kings. So there’s a lot of history there that’s been preserved because it’s simply part of the family history — there has never been a need to get rid of everything reminding people of the previous people in power. So there is quite a large number of castles and fortifications from 1204 onwards that are still (relatively) intact today — which is interesting. But it didn’t end there. Maxmillian II built his summer castle, Hohenschwangau, as some sort of fairy tale castle. And his son, Ludwig II, inherited that trait — he went on to build several castles, of which Neuschwanstein is the best known. It is no mistake when the Bavarians call them their ‘fairy tale king’. But these buildings are relatively modern (construction of Neuschwanstein started in 1869! ), so they are well preserved too. All this inspired us to plan for a vacation to Bavaria, to go see some castles. 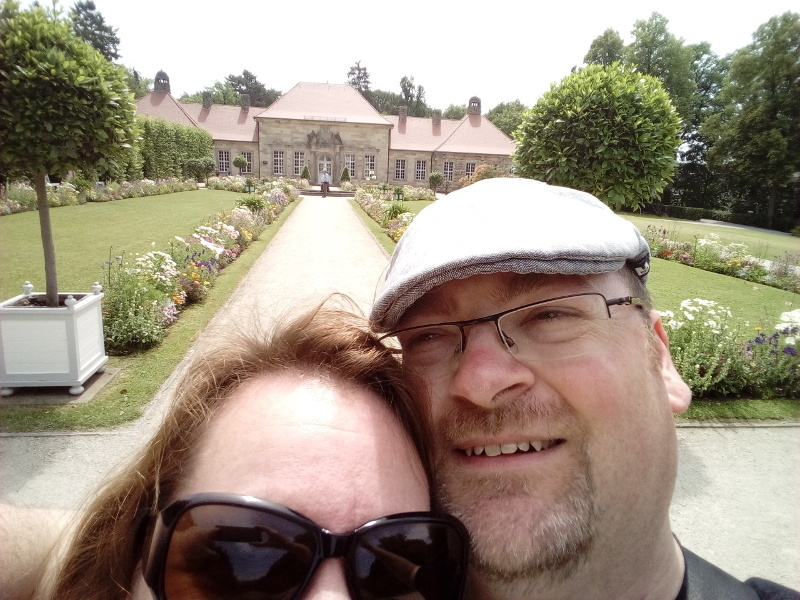 (Earlier this year, we did a week-long vacation in the Loire valley to visit some castles as well, so why not keep the theme?) 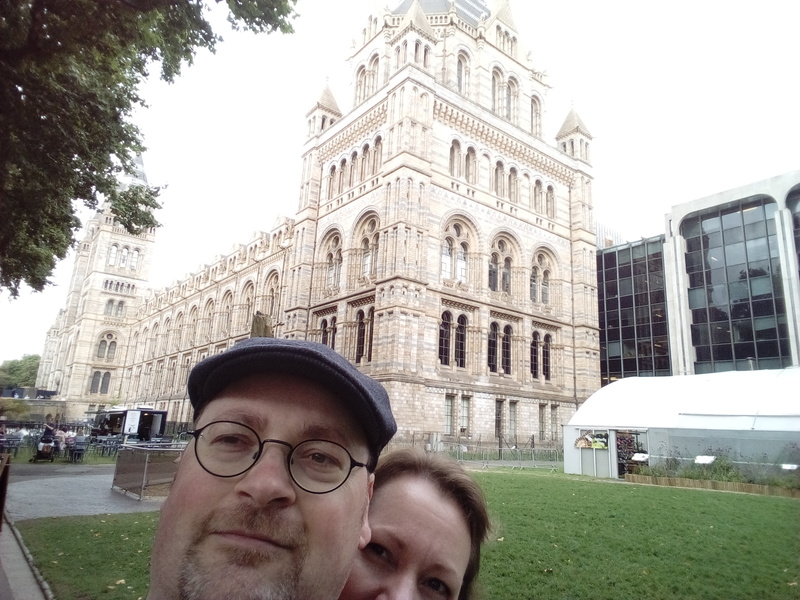 We hadn’t really planned an order or a list of things to see, but it all worked out. 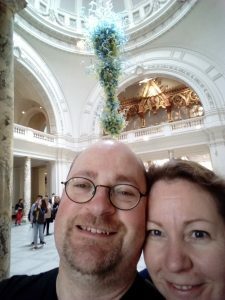 We spent five days in Bamberg (towards the north of Bavaria), six days in Ebersberg (near München, the capital of Bavaria and relatively central) and six days in Pfronten, which is towards the south-west, in the Bavarian Alps. 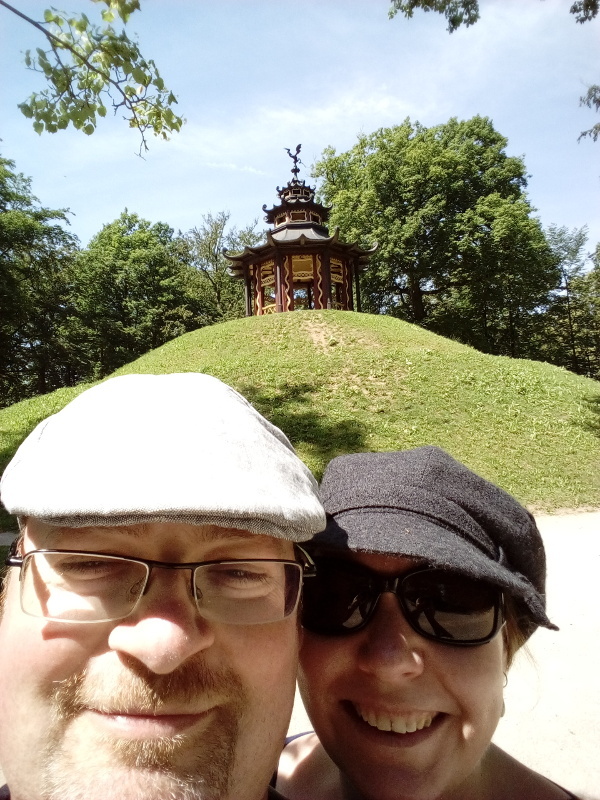 Every single day, we visited a castle, palace or a fortification (sometimes well-preserved, sometimes a ruin). We haven’t seen everything (the three-hour one-way hiking trip to see the royal lodge in Schachen and then hiking back three hours didn’t really fit in our plans or our physical condition), but we’ve seen quite a lot — and all of the highlights. 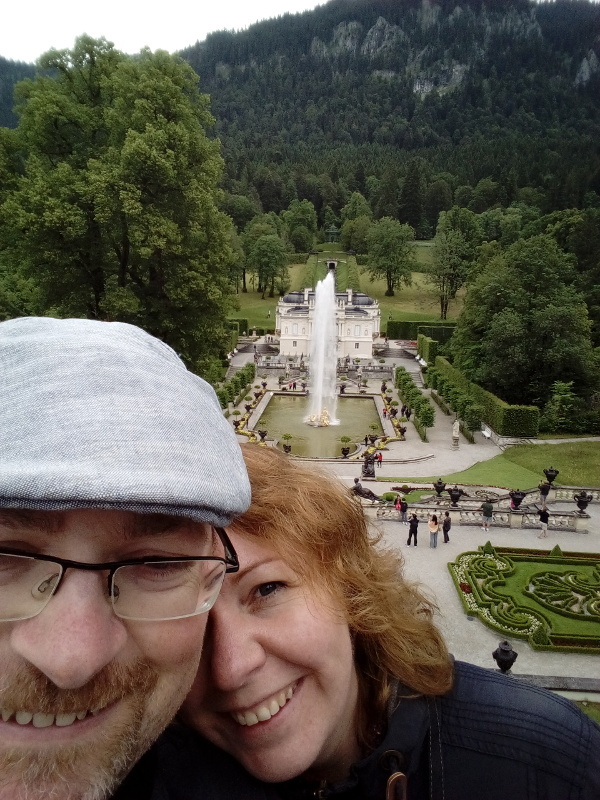 I’ve been taking crappy selfies with the castles that we visited (often only of the exterior, because photography of any kind was not allowed inside), and I want to share with you the crappy selfies of my top three Bavarian Castles. 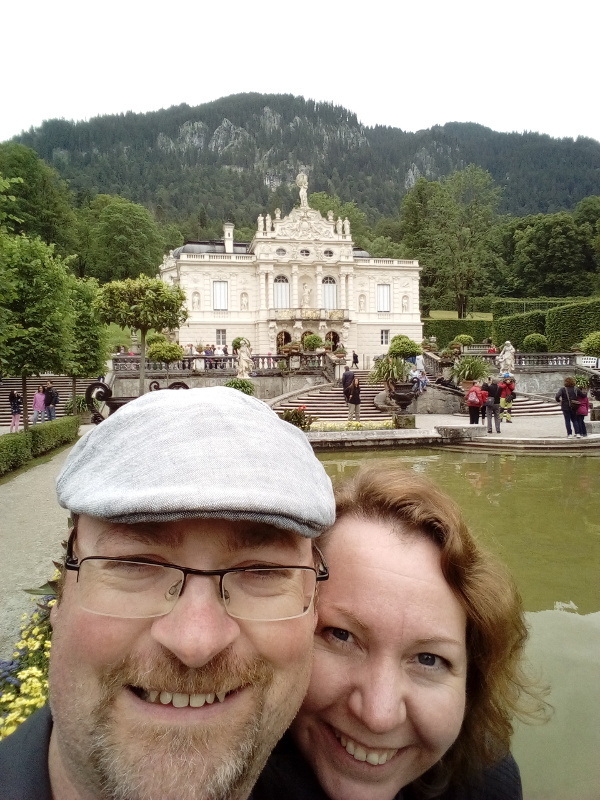 1: Linderhof Castle was built by Ludwig II. It is, as far as I know, the only castle that was actually completed. It is situated in the beautiful Bavarian Alps, and it is relatively small. Ludwig lived here for quite a few years, so it is the best expression of his creative drive. He was a big admirer of the absolutist kings of France, like Louis XIV, who lived 150 years earlier. By the time of Ludwig II, Bavaria had already been converted into something resembling a consitutional monarchy — and perhaps he felt like he was being sidelined by history. All the portraits in Linderhof are of Louis XIV, XV and XVI and their ministers and mistresses — there is nothing in there that refers to Bavaria! The rooms are lavishly decorated in barok/roccoco style, with plenty of gold leaf to go around, as well as lavish stucco ceilings and ‘stucco marble’. You just don’t know where to look… But there’s plenty to see outside as well. At the front of the castle is a terraced garden leading up to the ‘temple of Venus’, featuring a gold-plated fountain with a jet that comes higher than the castle itself! (Which isn’t running all the time, they turn it on every hour on the hour.) At the sides are formal gardens with gazebos and classical statues, and at the back is a cascade leading down from the ‘music kiosk’. And then there are the other buildings on the castle grounds, which are very special as well! There’s the Moroccan pavilion from the World Fair in Paris that Ludwig bought and the ‘Moorish Kiosk’, which is an opulent ottoman palace with rich decorations and detailing — both inside and out. 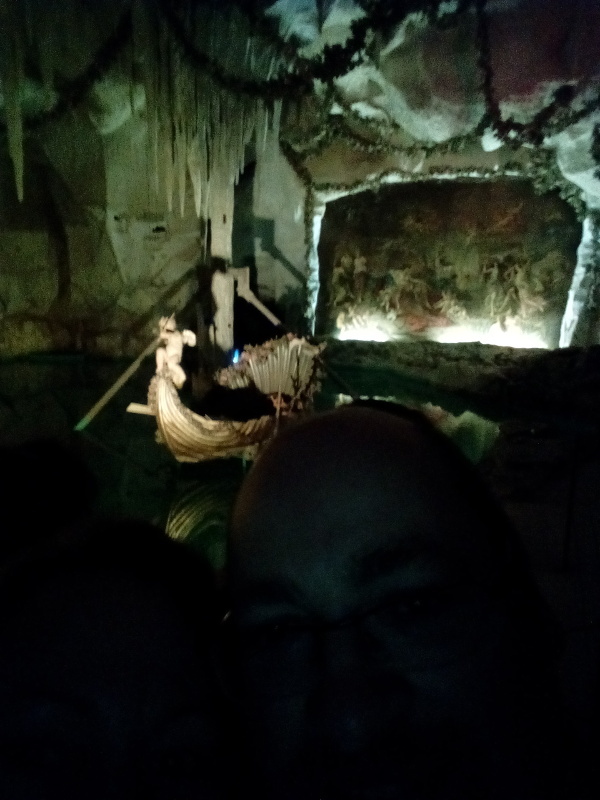 But the ‘piece de resistance’ is the Venus Grotto: an artificial grotto depicting the set for the first act of the Tannhäuser opera by Richard Wagner. It even features coloured electric light, and the water could be warmed as well by cleverly hidden furnaces! View from the terraced garden in the front of the castle, with the fountain active. The Venus Grotto, with the swan boat in the lake. 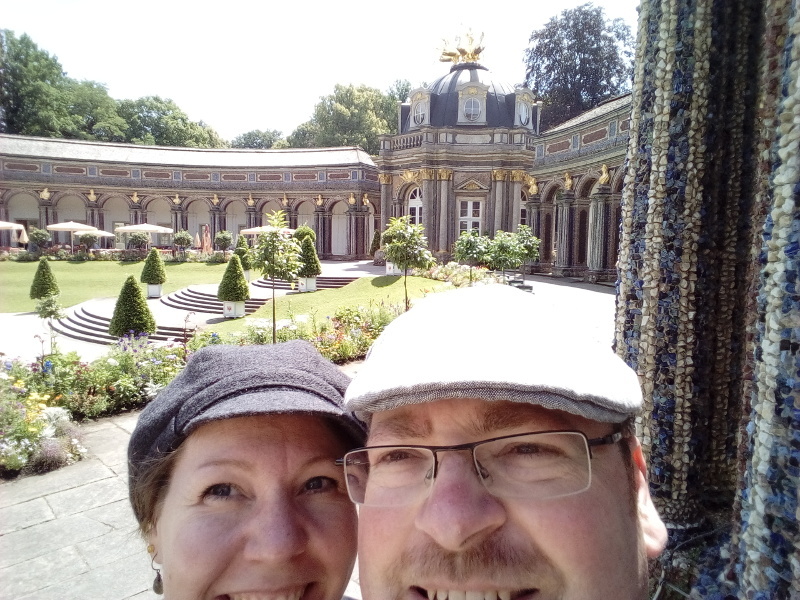 2: The Hermitage at Bayreuth started off as a place where the people in power could play they were hermits/monks/nuns! It was intended like some kind of LARP: you’d enter the compound dressed for the part and lived in contemplation for the duration of the ‘play’. Then, at the end, there’d be a huge feast and you could return to your ‘normal’ life. The simpleness of the rooms was offset by the beautiful ‘purification chamber’ (which you have to book a tour to see) and the banquet hall. Then a Prussian princess, who had been raised to become the queen of England, didn’t turn out to become the queen after all, and she was shipped off to be married to a Bavarian noble because they couldn’t use her at court in Berlin anymore. She was kinda bitter by it all, and she ended up at the Hermitage. They say living good is the best revenge, and she had her revenge by expanding and remodelling the keep, as well as building lots of things in the expansive grounds, from the fountain-filled ‘lower grotto’ (a fake ruin build like a ruined classical palace with lots of water features) and the ‘new castle’ with it’s richly decorated outside and formal gardens. 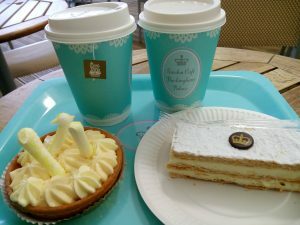 It is a wonderful place to wander around, enjoying the gardens and the buildings — do sit down at the terrace of the cafe in the right wing of the ‘new castle’ to enjoy the garden and the waterworks. Their chocolate cake is really good! And do book a tour — it’s very cheap, and you get to see the inside of the keep and the purification chamber, which is worth the price of admission alone. We’ve spent a lovely day here! The ‘Chinese’ pagoda, on top of an artificial hill. A spiral path cut into the hill leads up to it. The ‘new castle’. Note the mosaic on the pillars and the golden statue on the top of the main building! The main building of the original castle. Not much to look at from outside, but the inside…! 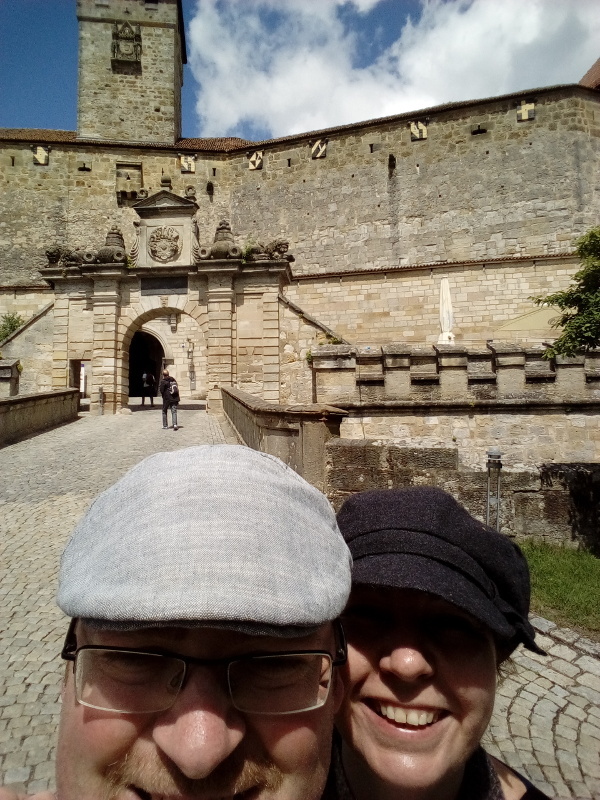 3: Veste Coburg is a fort towering high above the city of Coburg. From the city centre, you have to walk through a wonderful landscape park to reach it. (Think Goffert park in Nijmegen, except much larger — and on a hill.) It’s of military origin, so you have to go through some gates to get inside. Up there, you have a wonderful view of the surrounding land from the battlements: you can easily see for miles around. You can freely wander through the courtyards and access some of the battlements. But the real attraction is inside! The castle has been converted into a museum, and artefacts from the long history of the castle, as well as related objects, have been collected and are presented. And there is just so much to see! We saw a temporary exposition of bladed weapons from all over the world out of the private collection of a history professor, but when we went into the museum proper, we were really impressed with the rooms. Most castles are nice, but perhaps a bit impractical to live in — but not here. The private quarters are all elegantly panelled and have a practical layout. The enormous oak book cases lined the corridor with a cosy reading nook set next to a window — you could easily manage to see yourself living here. It’s cosy. And the ‘hunting room’ is a beautiful work of art, with the inlaid panelling all throughout the room (walls and ceilings) — truly a masterful piece of work! Once you get through those rooms, the museum starts in earnest. There’s art objects of all the eras that the castle has existed, but also paintings, wood carvings… There’s a whole museum’s worth of glass objects. There’s a large hall with various types of full-plate armour for man and horse, along with jousting lances. There’s… well, there’s a lot to see. There’s even a cellar with carriages and sleighs that were used for the “ladies’ caroussel”… You can easily spend a full day in Veste Coburg. One of the cellars with carriages and sleighs. Honorable mention: the München Residenz treasury because it’s just so cool. This is the treasury of the Wittelsbach family (except for the reliquaries, those are exhibited elsewhere — with the exception of the St. George reliquary) and it is glorious. But the family has been in power for over 700 years, so they have quite a bit of… stuff. Like a collection of crowns. I mean, sure, you could have a crown, but they have a collection of them. 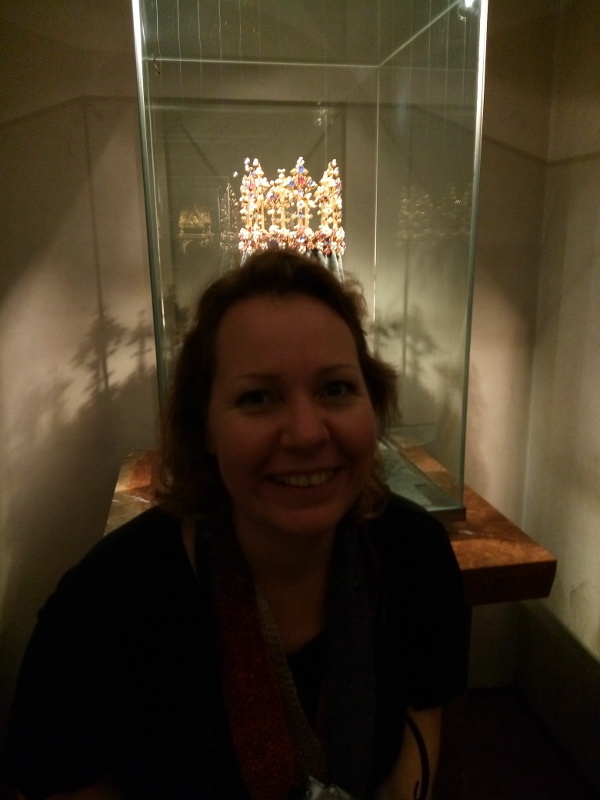 I mean, I have seen the British and the Danish crown jewels, and they’re impressive — but that would be just one of the items on display here — one of many. 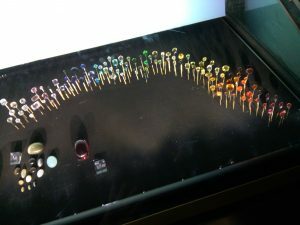 Travelling altars, icons, drinking vessels — made of shells or rhino horns, trimmed with silver or gold, set with jewels… A whole friggin’ table made out of precious stones, artfully inlaid to depict a scene. Even ‘mundane’ stuff like an hourglass — except it’s made of artfully worked silver inset with rubies as big as your pinky nail. There is just so much to see, and it’s all so exquisitely crafted with such precious materials! I caught myself drooling a few times… The wealth is really mindnumbing. So yes, Neuschwanstein isn’t even in my top three… I mean, it’s nice and all, but these three are better. Go figure. I was also pleasantly surprised by the prices for the admission tickets. Whereas you’d easily pay EUR 15 to get admitted into a castle in France, you’ll easily get admittance for two for that price in most castles! 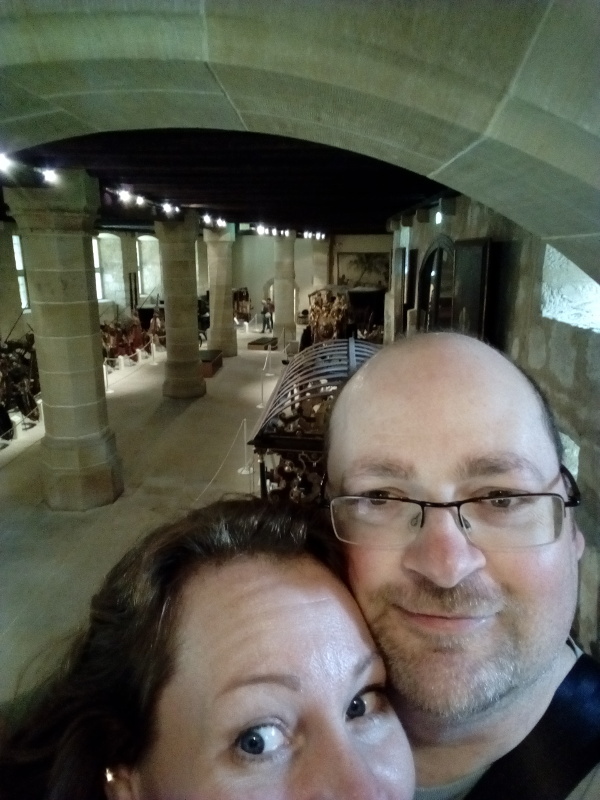 In some places, that also includes a guided tour — for instance, while you can visit most of the rooms of the Würzburg Residenz on your own, there are rooms that you can only visit under the supervision of a guide. Sometimes you book a specific tour (and there is often the choice between German and English), sometimes you just have to wait for a bit before the next tour starts off. Some castles you can only see as part of a tour. 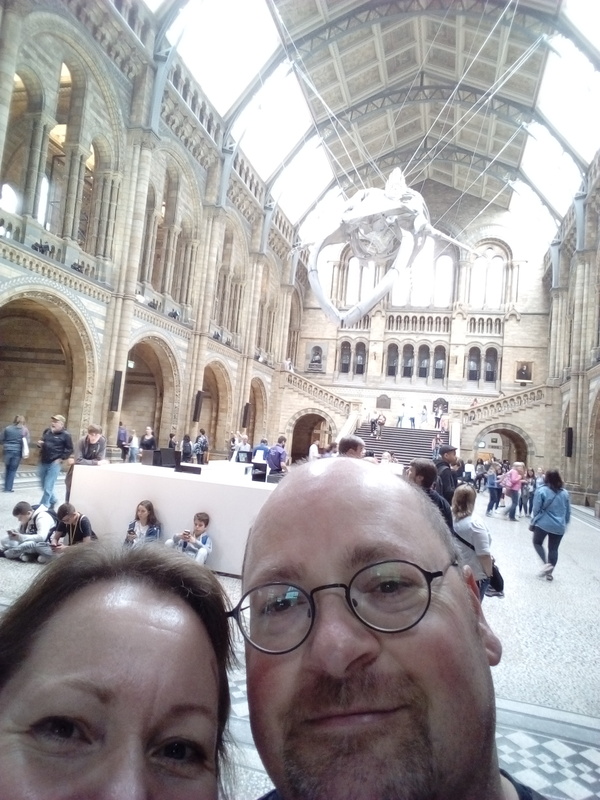 And unfortunately, on most of those guided visits, photography of any kind is not allowed. But that’s not too much of a problem, is it? I can heartily recommend a visit to Bavaria and its many castles! Last Monday, we managed to catch the kitties (with a surprising lack of drama, thankfully) and deposited them at the regular cat-sitting adress. As usual, they weren’t too thrilled, but we know from experience that they always manage to have a good time there. It was busy, being in the middle of vacationing season, but at least they have each other for company if they get into trouble. Then we set out for the long drive to Herlev (which is a suburb of Copenhagen). We stopped at a few rest stops, mainly to eat a sandwich, drink some juice and swap out the driver. We made good time, and the children are very much used to long car drives — they had installed their portable DVD player in the car, and used that to while away the time. We arrived at their home just before dinner, so excellent timing! Especially since they had to go to school right the next day — school holidays in Denmark are already over. The next day, we took it easy and got up rather late, while the rest of the family had already left for work or school. Then paultje (my sister) returned, and just before lunch time we collected my niece at her school. She goes to a school for gifted children, and it was fun to look around there. Then we drove to the S-train station at Herlev and changed for the metro after some stops. We took the metro into the city to get to the Paludan cafe for lunch. It’s situated in a (used) book store, which gives it a nice atmosphere — we had been there before and liked it very much. But before we arrived, paultje and klik ducked into a clothing store to shop — so N and I went to a games shop to check out the nice chess sets they had on display there. 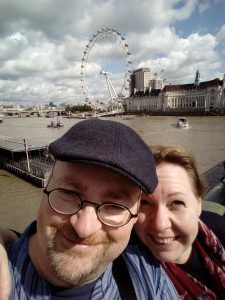 When we had seen everything in the store, we went back to discover that the clothes shopping was still going on… After some time we managed to make our way to the cafe, and we enjoyed a tasty burger there, surrounded by antique leatherbound books. 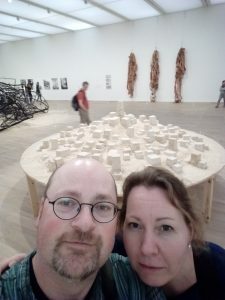 The next day, we went to the Arken Museum for Modern Art. They had a good selection of art on display (including an exhibition of works by Hundertwasser), and the building itself is really interesting as well. I did discover that I’m not a big fan of Damien Hirst, too. On Friday, paultje had taken the day off, and we went to Creative Space, which is a cafe where you can paint porcelain objects. Paultje is a regular there (the personnel knows her by name), and she uses her own creations as tableware. We selected some things and started painting — my creation was described as “a ‘to go’ mug with a blue pattern”. It takes a week to glaze and fire the porcelain, so we couldn’t take our things home with us — paultje will collect it next Friday. Yesterday (Saturday), we had breakfast with the whole family and re-packed our stuff. At 11:00, we said our goodbyes and set off for the second part of our vacation. We have hired a cottage on Samso, an island in between Sealand (the island where Copenhagen lies) and Jutland (the part of Denmark that’s attached to Germany). We had reserved a spot on the ferry, and had to be in Kalundborg at 13:05 the latest, and the drive to there would take about 70 minutes. We had been warned that the supermarkets on the island would be but simple affairs, so we thought it best to do some shopping in Herlev before we set out in earnest. We also had no cash on us, so that was also something to take care of. The boat ride out was un-eventful. We had lunch on board, went outside for a bit (windy!) and sat out the rest of the two-hour ride inside, reading. We did walk over to the beach after dinner (which is only 100 meters away from the cottage) and saw the boat from Hou (in Jutland) arrive, about 50 meters from where we were standing. Today, it was a bit rainy. We had thought to take a drive to the most northern tip of the island, which is advertised as a scenic spot. When we parked the car, it was almost dry, so we set out on foot towards one of the geocaches I had put in the GPS receiver (all 79 active ones on the island). But about halfway it started raining in earnest, and we got soaked quite quickly. We doubled back to the car and drove to the main village on the island in search of something to cook for dinner tonight. Quite contrary to the reports we received, there were two well-stocked supermarkets in the village, and both were open on Sunday. So we managed to stock up on provisions, and we even filled up the tank! Then we took a meandering drive over the island, from small village to small village, to get a feel of the island. It feels like Ameland to me, except it’s bigger. 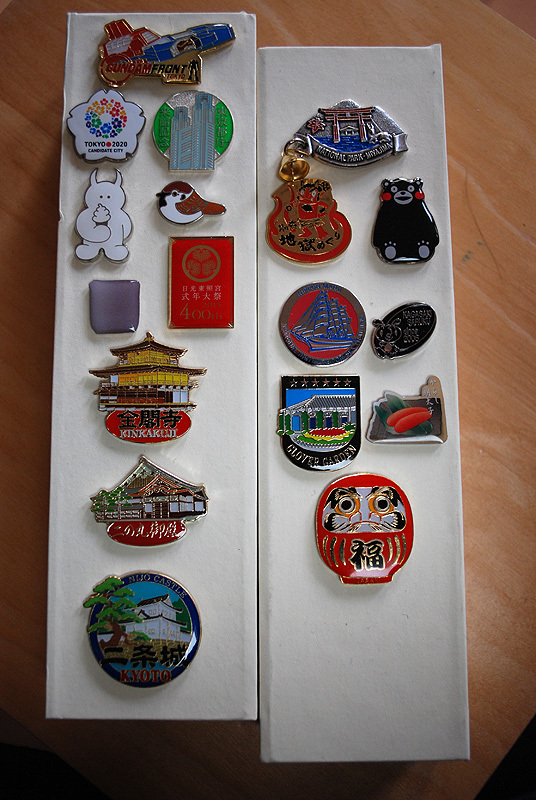 During our trip, I kept an eye out for pin badges of the places we’ve been to, as a souvenir. I got quite a haul this time! Top left is a pin I got from a gashapon-machine outside the trailer-shop of Gundam Front Tokyo, just behind the ‘life-sized’ Gundam model at Diver City Odaiba in Tokyo. I got only one, and I got the rare pin: a gold-foil version of a design of some sort of transport platform. Below is the text ‘Gundam Front Tokyo’. Left below that is a pin to show support for the candidacy of Tokyo for the 2020 Summer Olympics. I bought this on top of the Metropolitan Government Office. There’s another pin like this, but it’s rectangular — I saw lots of civil servants wearing that type, it didn’t seem to be for sale. Next to that is a pin of the Metropolitan Government Office, with it’s cathedral-like two towers. I got this from a gashapon-machine on one of the observation decks on top of that building. Under the Tokyo 2020 pin is a pin of the mascot of Studio Uamou, eating an icecream. I bought it from the designer herself. Next to that is a pin of a sparrow, made by the Japanese bird protection society which I bought in Shinjuku Gyoen. Next to that is a pin celebrating 400 years of the Tokugawa shrine in Nikko (deservedly a World Heritage site) in 2015. The ‘mon’ on the pin are the three hollyhock leaves of the Tokugawa clan. Underneath that is a large pin of Kinkakuji, the Golden Pavillion in Kyoto. The two pins underneath depict Nijo Castle, the shogun’s castle in Kyoto. On the right, at the top, is a pin showing the floating torii of Miyajima. Curiously enough, it has a little bell attached to it — haven’t seen that in a pin before! Underneath that, to the left, is a pin I got from a gashapon machine in Yufuin, depicting an oni (Japanese devil) at one of the more sulfuric hot springs of the area. Underneath that, to the left, is a pin of the Nippon Maru, a sail ship of the Japanese merchant marine school. We saw this ship in Nagasaki, where it was for the Tall Ship Festival. Next to that is a pin of the mascot of Nagasaki city, which I bought at Dejima. Unfortunately, there were no pins of Dejima itself. Underneath that, to the left, is a pin of the Glover Gardens, a kind of theme park where all Western-style houses are gathered. The gardens are lovely, but the buildings themselves are being neglected, which is a pity. The pin was only sold as a set with a bookmark, too. Last is a pin of a Daruma doll which I bought on Fukuoka airport. I don’t know what it is, but I like Daruma dolls, so I couldn’t pass this one up. I will need to make a new box to keep these pins in, as well! Saturday, we got the big envelope with our vacation papers from the post office. It had been sent by registered mail — and of course we both work so we had it delivered at the post office instead so we could get it at our leisure. It’s mostly folders of the places we’ll be visiting. We’re really looking forward to it. We’re flying out on April 7th, back on April 29th. We’ll be staying in Tokyo, Nikko, Kyoto, Naoshima, Hiroshima, Yufuin, near Mt. Aso, Nagasaki and Fukuoka. 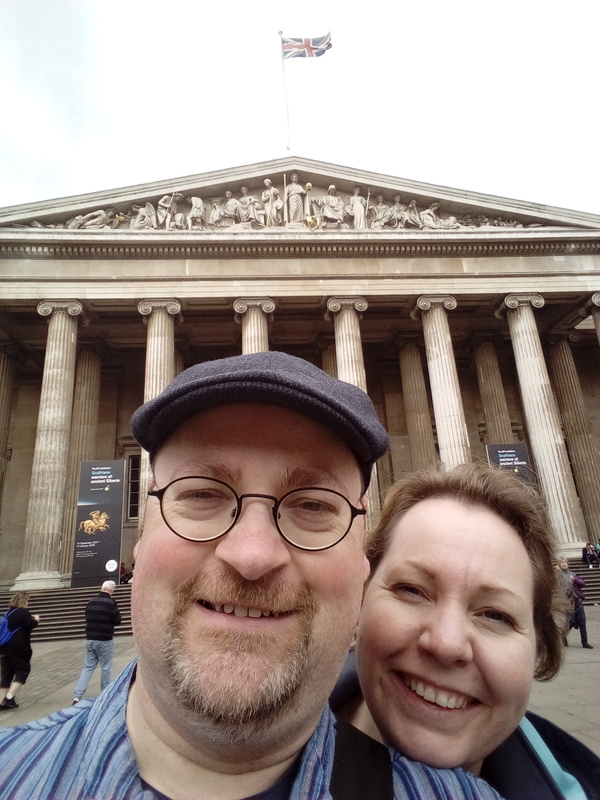 So lots of travel, but with a good mix of places we’ve been before and new (to us) places. Especially looking forward to visiting Tokyo again, and seeing what Naoshima is all about. We’re both very much looking forward to it. To get in the mood, we went to Amsterdam on Saturday, to see usmu and take him to the okonomiyaki place there. Lots of fun and good food was had by all. Again, most of the photographs of our vacation were taken by klik. But again, I had the pocket camera with me, which has the panorama setting! Cutty Sark — or at least the rebuilt version. This is at the Thames riverside, on the Greenwich side. On the left side of the photo you can see a little brick building with a domed roof: that’s the entrance to the tunnel under the Thames. 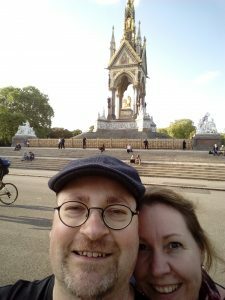 In front of the gates of the Royal Observatory in Greenwich. The prime meridian runs just behind the gate on the left (where you can only get to when you pay the admission — well worth it for the exhibitions IMO). In the front, you can see the stands that were built for the Olympic Games: the equestrian competitions were in Greenwich Park. They were taking them down, but the complex is so big that it’s quite a bit of work. To the right, you can see the O2 Arena in the distance. Straight in the middle, you can see the high buildings of Canary Wharf. On the Thames Walk, which runs from Canary Wharf to the Tower, along the north side of the river. You can see it’s low tide here: the difference in water levels can be up to 9 meters. Further along the Thames Walk. – Going by Eurostar train is comfortable, easy and quite cost-effective (if you book some time in advance). Yes, there is security screening, but it’s nothing like the screening for airplanes. We could take our lunch (including a liter of water) with us on the train. We could each take two suitcases with us, as well as a handbag. You do not have to relinquish control of your luggage to others. You arrive (and leave) right at London city center, with the underground mere steps away. Next time, we’ll take the train again. – Booking an apartment instead of a hotel is totally worth it. Yes, it’s more expensive, but having a comfortable couch and a full kitchen makes it so much easier to ‘decompress’ when getting back to your home base. And the maid comes only once per week, so you don’t get bothered at all and can leave your stuff out just the way you want to. The added option of cooking your evening meals or even having them delivered to your apartment is nice too – though we didn’t use it. 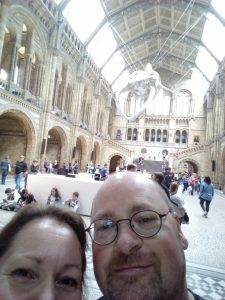 – I’m very impressed with the free museums in London. We’ve visited both the Tate Modern and the Victoria & Albert Museum. Both are free, but ask a (voluntary) donation of GBP 3, which is a paltry sum for what you get. Sure, there are extra exhibitions that you might have to buy a ticket for, but the regular collection is big enough to keep you interested for the whole day. – Somehow, it turned out to be impossible for us to see St. Paul’s. 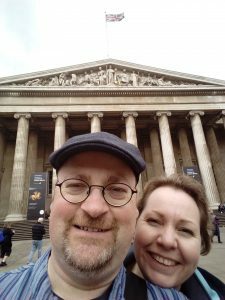 – Greenwich is a lovely place to visit. There’s the park and the Royal Observatory, but the village itself is also nice with quirky stores and cafes.